If you are looking for excellent quality Freeman Gag Bit with a Rope Nose Band you came to the right place. Here at Horse Tack Now we strive to offer the finest Horse Tack Equipment availiable. 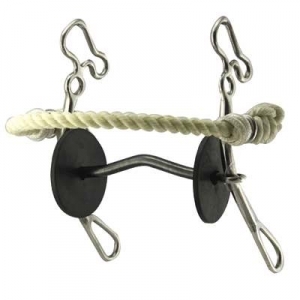 We only offer high-quality Gag Bits and this particular bit comes with Rope Nose Bands. This German Gag also features a rope noseband. If you are in need of Freeman Gag Bits this item is just what you need.